Debate On Role Of Islam Divides German Government : The Two-Way Members of the Merkel government agree that Muslims belong in Germany but disagree on whether the religion itself does. 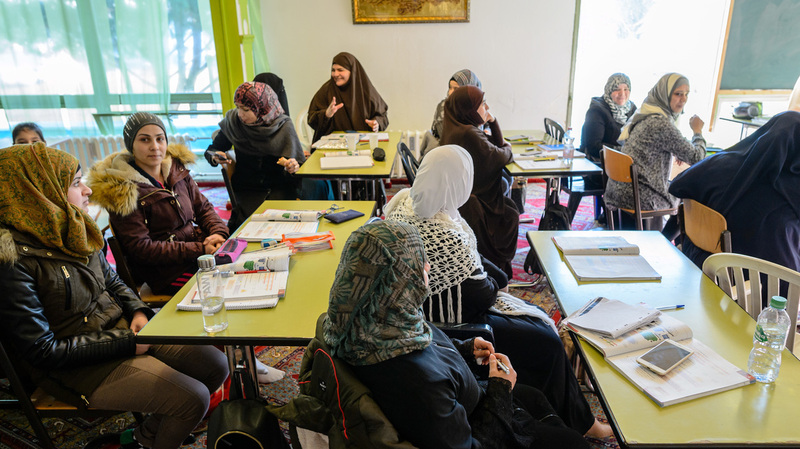 Muslim women from Syria take a German language lesson at a Muslim cultural center in February in Halle, Germany. Germany's new minister of interior, Horst Seehofer, has stirred up debate about the role of Islam in Germany. In an interview with the German newspaper BILD Seehofer said: "Islam is not a part of Germany. Germany has been influenced by Christianity. This includes free Sundays, church holidays and rituals such as Easter, Pentecost and Christmas. However, the Muslims living in Germany obviously do belong to Germany." This statement conflicted with the position of German Chancellor Angela Merkel. Merkel said, even though Germany has been influenced mainly by Christianity and Judaism, there are more than four million Muslims in the country, they "belong to Germany and so does their religion." Konstantin von Notz, member of the opposition Green party, protests, "The statement of Interior Minister Seehoher is complete nonsense. Germany cannot afford such behavior in the important questions of integration." "Freedom of religion is a fundamental right guaranteed to everyone by our constitution," said Andreas Nick, a member of Merkel's Christian Democratic Union. "Individuals should be judged by their behavior which of course needs to comply with the laws of the land — no more, no less." Apart from members of Seehofer's Christian Social Union, only the far-right Alternative for Germany, or the AfD, agreed with his statement. The AfD's spokesman Jörg Meuthen told NPR that he himself had made similar statements many times before. He maintained that Seehofer was simply not credible on the subject, and the interior minister's remarks should be viewed as "a populist attempt" by the CSU to take votes from the AfD "ahead of the Bavarian elections in October this year." "Islam is definitely part of Germany: millions of Muslims live in Germany and have become citizens of this country," Mouhanad Khorchide, head of the Center for Islamic Theology at the University of Muenster, told NPR. "We cannot differentiate between Islam and Muslims. According to the German constitution there is no religion without the individual." Khorchide expressed concern about the consequences of Seehofer's interview. "Such statements polarize the German society," he said. "Instead of talking of a 'we,' which would include Muslims, the conversation now distinguishes between Germans and Muslims. For many Muslims this creates a feeling of being unwanted and unwelcomed. Many of them are second or third generation residents, and Germany is their home." An expert on Islamic law, Mathias Rohe, believes the whole debate to be meaningless. "Of course Germany has been influenced by Christianity – but no one ever doubted that," he said. "No Muslim has ever questioned the Christian history of Germany or demanded a change in that understanding." It would make more sense, he said, for people to "concentrate on the considerable number of concrete issues" that will need to be addressed in Germany in the coming years.